The Salish Sea is a system of coastal waterways in Canada and the US. The Salish Sea encompasses Puget Sound, the Strait of Juan de Fuca, and the Georgian Strait. The Salish Sea is a system of waterways in the coastal regions of Canada and the US. It runs along British Columbia's southwestern part and the northwestern part of the US state of Washington. The waters of the Salish Sea are part of the Pacific Ocean and head inland as the Puget Sound, the Georgian Strait, and the Juan de Fuca’s strait. It stretches from the northern part of the Georgia Strait to the Hamersley's head at the Oakland Bay. The Sea has several major port cities including Victoria, Tacoma, Seattle, Vancouver, and Port Angeles. The term Salish Sea was coined in 1988 by American marine scientist Bert Webber, who was a resident of Bellingham. The theory behind the name is that it would denote all of the Puget Sound, the Strait of Juan de Fuca, and the Georgian Strait. The Salish Sea would be a name that would assign no special privileges to any of these straits, but would instead complement each one. Other names given to the region encompassing the waterways include Puget–Georgia Basin, Georgia–Puget, or in the singular form of the Georgia Depression/basin. 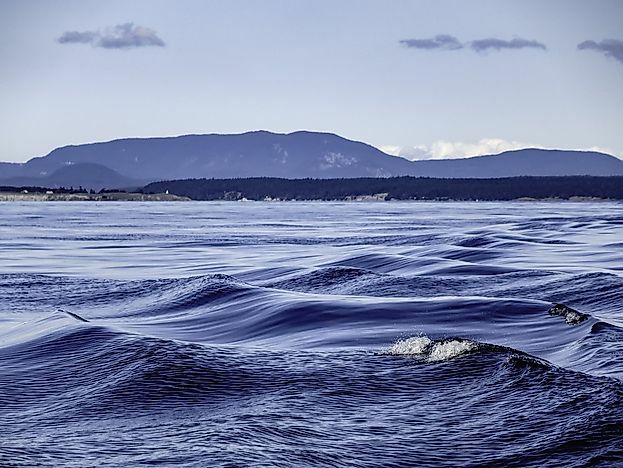 The official name Salish Sea was initially proposed by the Chemainus First Nation and the idea approved by Mike de Jong who was in charge of B.C. 's Aboriginal Relations. The process required a written application to the Geographical Names Board of Canada. The main reason behind its name was to raise the awareness of the waterways to the government and people and the need to protect it from pollution and overexploitation. When the name Salish was adopted, it was met with opposition for historical reasons. The argument was ended in 2009 when the United States Board on Geographic Names adopted the name Salish Sea under the recommendation of Geographical Names Board of Canada. The French translation Mer des Salish is an official name in Canada. The Salish Sea is part of the three major straits, namely the Puget Sound, Georgia Strait, and the Juan de Fuca. The straits have smaller adjoining waters including Bellingham Bay, Rosario Strait, and Haro Strait. It is also part of the waters between the San Juan Islands in the Washington state and the British Columbia’s Gulf Islands. The western end of Salish Sea is bounded by the Juan de Fuca Strait between Carmanah point and Cape Flattery, while the south part of Puget Sound is at the southern endpoint. The Salish Sea is bounded at the northern part by the northern point by Georgia’s Strait. The northern part also includes the tidal waters of the Discovery Passage, Sutil Channel, Lewis Channel, Waddington Channel, Desolation Sound, Pendrell Sound, and Homfray Sound. These boundaries of the Salish Sea were set in 2002 based Puget Sound Ecosystem Report of Georgia Basin. The ecosystem report records that the entire stretch of Salish Sea covers approximately 6,900 square miles. Are There Sharks in the Mediterranean Sea?